BRISBANE, Nov 7 2012 (IPS) - The Pacific Islands are making steady progress on reducing child mortality, but most are struggling to eradicate poverty and generate employment for young and rapidly growing populations. With three years to achieve the United Nations Millennium Development Goals (MDGs), progress fluctuates across the region, according to a recent report by the Pacific Islands Forum (PIF), a regional inter-governmental group. The good news, according to the PIF report, is that 10 of 14 Pacific Island states surveyed, including Vanuatu, Marshall Islands, Cook Islands and Tonga, are on track to reduce MDG4 that deals with child mortality. The 2012 Regional MDG Tracking Report comes three years after PIF countries signed a compact to strengthen the co-ordination of resources to boost development progress. Successes and long-term challenges are evident at the sub-regional level. Melanesia, with a large population average of over two million, dominated by Papua New Guinea (PNG), is off track on the goals. In contrast, Polynesia, comprising Cook Islands, Niue, Samoa, Tonga and Tuvalu, with an average population of 62,000, is on target with four goals. The Cook Islands and Niue are the only states likely to achieve all eight MDGs. Halving the proportion of people living in extreme poverty by 2015, as mandated by MDG 1, is a considerable challenge across the Pacific. In PNG, approximately 28 percent of the population of seven million lives below the poverty line, a five to 10 percent improvement since 1990. Critical factors include a large remote rural population, corruption, high incidence of violence and an HIV epidemic. Some 23 percent of Tongans live below the poverty line with increased hardships for families due to impacts of the global financial crisis, low economic growth and inflation. There are also variations at the sub-national level with rural communities experiencing higher levels of poverty in Fiji, Palau, Samoa and Tonga, while there are greater numbers of urban poor in the Solomon Islands, Kiribati, Tuvalu and Vanuatu. Poverty is not easily defined in the Pacific Islands where the benchmark of earning less than a dollar a day can be inaccurate. Pacific societies have a long history of subsistence agriculture, self-sufficiency and retain a strong belief in social obligations within the extended family and community that can capture the needs of the most vulnerable. But even in rural villages, centuries of traditions are changing in varying degrees with the influence of cash economy, rapid urbanisation and cultural pressures of modernisation. “It may also mean not having a sense of belonging to a ‘vanua’ (land or village) or place, or that one is disconnected from one’s tradition or community,” Cerelala told IPS. 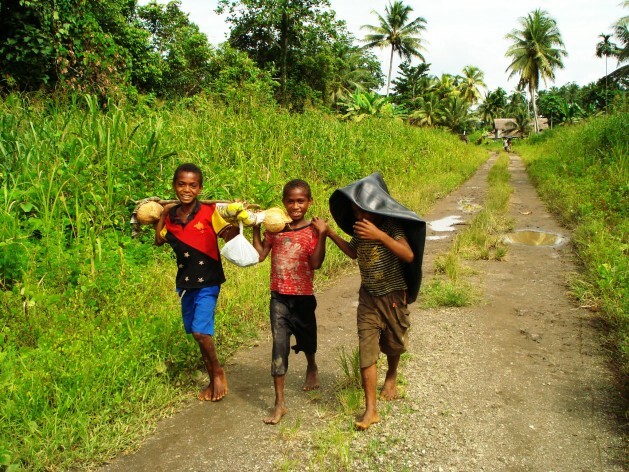 The PIF makes a case for the term ‘poverty of opportunity’ in the Pacific Islands. All island states in a region of 10 million people and growing by 188,000 a year are challenged to provide full productive employment with youth unemployment a growing concern. Only the Cook Islands and Niue, with employment rates of 70 percent and 80 percent respectively, are on course, with Kiribati recording 44 percent and Samoa 30 percent. While MDG7 – that calls for improving the lives of slum dwellers – did not feature prominently in the report, urbanisation has reached a high rate of 4.2 percent in the Solomon Islands and Vanuatu. Squatter settlements, beset with insecure land tenure and sub-standard housing, are growing in Melanesia as greater numbers of people seek jobs and access to services unavailable in provincial areas. Approximately half of the residents in PNG’s capital, Port Moresby, and 30 percent of the urban population in Vanuatu reside in informal settlements. But in a positive trend most Pacific Island states are expected to reduce child mortality by two-thirds in line with MDG4. “This could be attributed to the successes of awareness programmes carried out by national and regional public health authorities to encourage immunisation and proper healthcare for babies, more trained human manpower for the implementation and monitoring of child health programmes,” Gordon Nanau, lecturer in international affairs, University of the South Pacific, Fiji, said. Nanau, who is also a member of the Oceania Development Network, said bilateral and multilateral support were also important factors in achieving MDG4. Fiji with a population of 868,406 has reduced the under-five mortality rate from 28 to 18 per 1,000 births since 1990, which is attributed to implementation of holistic integrated management of childhood illness strategy and good obstetric services. In Tuvalu, with high measles immunisation coverage, the under-five mortality rate decreased during the last decade from 35 to 25 per 1,000 births. The PIF believes that accelerated regional progress on the goals before 2015 is dependent on political will. Nanau agreed, but added “that even with determined political leadership and improved governance, financial and human resources and capacity” are also imperative.